Nuxe Pamper Hamper Wish List for Spring! I was contacted a few days ago about a new competition by Nuxe UK, it is their first blogger competition and I was very excited to take part! 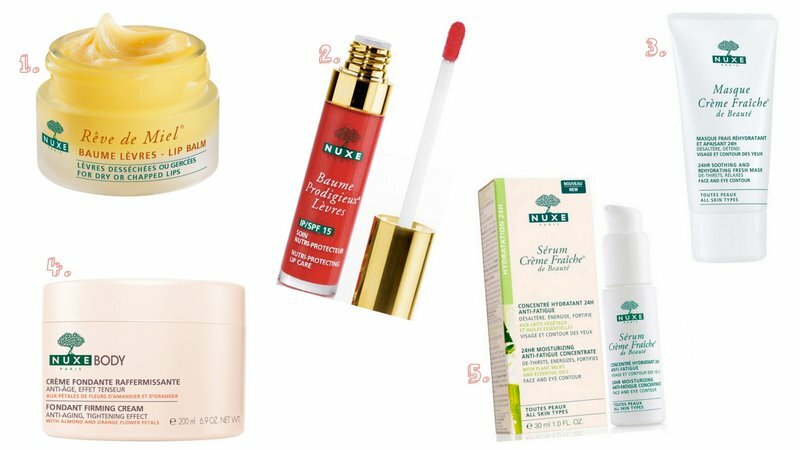 Nuxe is a brand that I have tried a few times with items such as the amazing Nuxe Reve De Miel lip balm (both the pot and the stick versions are fantastic) and their Nuxe Huile Prodigieuse dry oil is great too. This post is not sponsored but it is my entry into the Nuxe UK Blogger Competition (it ends on the 10th March, UK bloggers only). Here are my picks from Nuxe for spring! 1. Nuxe Reve De Miel Ultra Nourishing Lip Balm (£9.50): Yes that is quite a lot of money for a lip balm but I have been using mine constantly since I bought it about one month ago - I haven't used any other lip balm since! My lips are dry all year round and this is one of the best balms I have tried. I apply a thick layer just before bed so in the morning my lips are super soft and smooth - use a lip scrub first to make the balm even more effective. 2. Nuxe Baume Prodigieux Levres (shade '04 Rouge Charismatic', £15.50): As well as a great range of skincare and body care products, Nuxe also make a small range of makeup, such as these gorgeously packaged lip products. From the sounds of it, it is a mixture of a tinted gloss and a lip balm, what could be better! The shade '04 Rouge Charismatic' looks so fresh and pretty, perfect for spring! 3. Nuxe Creme Fraiche de Beaute Mask (£19.50): Spring in England is still rather chilly and an added moisture boost is just what the doctor ordered. This mask aims to keep the skin hydrated and soothed for 24 hours, impressive. Just a quick tip, to improve the effectiveness of all face masks - apply them while in the bath so the heat and steam will allow the face to absorb easier and work more effectively! 4. Nuxe Body Fondant Firming Cream (£34, 200ml): I am 21 (22 this year, I'm getting old!) but I am always looking out for firming body product products to just give the skin a bit of a boost and added firmness. I have tried a few firming creams and this one sounds gorgeous - the statistics make it even more appealing. 5. Nuxe Serum Creme Fraiche de Beaute (all sensitive skins, £27): I have tried a few serums and I find they make a nice addition to my skincare routine all year round. A serum for me needs to smooth/soothe the skin and give a little extra moisture - this ultra-concentrated serum sounds like it will definitely fit the bill for my dry, sensitive skin! Labels: beauty, blogger competition, Lifestyle, nuxe body fondant firming cream, nuxe creme fraiche serum, nuxe pamper hamper competition, nuxe rouge charismatic, nuxe spring., nuxe uk, nuxe uk wish list. Categories: beauty, blogger competition, Lifestyle, nuxe body fondant firming cream, nuxe creme fraiche serum, nuxe pamper hamper competition, nuxe rouge charismatic, nuxe spring., nuxe uk, nuxe uk wish list. I have never tried any Nuxe products but they look great. I've been looking for new products!!! Glad I came across this post! Cute blog!! Great products and thanks for sharing as I never heard about Nuxe lip balms!! I love lip products so I'd love to try out their lip balm. I haven't used anything from Nuxe before. What a great wishlist, I've only tried one Nuxe thing before and it was lovely! i adore nuxe - their products are so good!